When building a deck that will sit relatively close to the finished grade of the surrounding soil, you may want to consider using precast concrete deck pier blocks. Precast concrete deck pier blocks work great for transitioning from a concrete footing pad to the actual deck framing lumber. They are fabricated with built in notches to support 2xN lumber and are designed to be placed on top of a concrete footing pad while the concrete footing is still wet. Deck pier blocks can be a little tricky to properly set and align, however with a torpedo level and plumb bob the average DIY homeowner can have success installing them. Before installing concrete deck pier blocks it is imperative to first install concrete footing pads below the frost line for your local area. The depth of a footing hole can vary anywhere from 12 to 60 inches depending upon where you live. In New Hampshire for example, the frost line can run as deep as 36 to 48 inches. To install a precast concrete deck pier block, first dig the hole for the concrete footing pad. Again, make sure it is deep enough so that the base of the hole sits below the frost line for your climate region. In addition, the diameter of the hole should be approximately 12 to 24 inches in diameter. It should also be wider at the base of the hole. Then pour premixed concrete into the footing hole until the concrete is within 2 to 3 inches of the top of the hole. Next, while the concrete footing pad is still wet and workable, place the precast concrete deck pier block on top of the poured concrete footing pad. Work the base of the deck pier block into the concrete footing several inches by pushing and twisting it downwards. 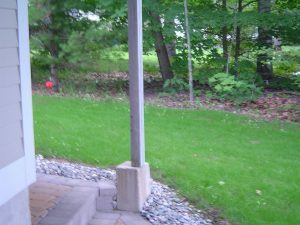 Again, it is imperative that the concrete deck pier block be properly aligned and level. Use a torpedo level to make sure the deck pier block is plumb and level on top. Use string, wooden stakes, and a plumb bob to properly align the concrete deck pier block. Wrap string around the wooden stakes that are positioned so that they outline the exterior frame of the deck. The string should be situated so that it sits approximately 12 to 18 inches off the ground and is centered over the outer deck edge footing pads. 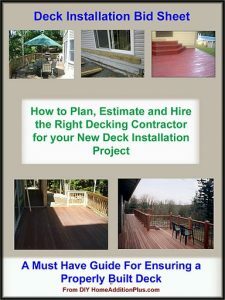 Use this Deck Building Checklist to save time and money on your deck project. Position the plumb bob just under the string and over the concrete footing pad area to locate the exact position and alignment of the concrete deck pier block. Gently tap the deck pier block to put it in proper alignment relative to the plumb bob. Also make sure the notches are properly aligned to support the deck framing correctly. The center of the precast concrete deck pier block should sit directly underneath the plumb bob. Repeat this process for all the required concrete deck pier blocks and then allow them to set up for 24 hours before continuing on with building your deck.